When this card is Synchro Summoned while you control no other monsters: You can target 1 “Junk” monster in your GY; Special Summon it. You can only use this effect of “Stardust Assault Warrior” once per turn. If this card attacks a Defense Position monster, inflict piercing battle damage to your opponent. Stardust Assault Warrior is a very well named monster on the wrong artwork. It’s a Level 6 Wind Warrior-type Synchro Monster with 2100 Atk and 1200 Def. Any two monsters will work to get this out including junks and wind witches. When Synchro Summoned you can revive targeted junk monster from the grave once per turn. SAW also does piercing damage to things in Def, which means nothing to Link Monsters. So it’s the first effect that matters for either Synchro Climbing or Link Climbing because piercing on a 2100 Atk stat is nice but not particularly effective. You can make explosive plays if you Synchro Summon this during your opponent’s turn and revive a Junk Synchro Tuner monster and mess with them on their turn. But combos like that don’t really work anymore and are not worth the investment. 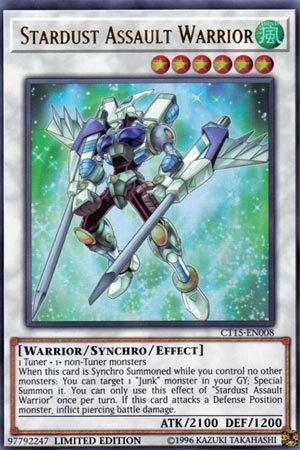 However Stardust Assault Warrior is pretty good in a junk turbo synchro deck and looks cool. Score: 3/5 Art: 4.5/5 A good name and good art, just not together. From the Nebula Neos tin to the Junk Speeder tin, we have one of the promos from that tin, Stardust Assault Warrior. Assault Warrior is a Level 6 WIND Warrior Synchro with 2100 ATK and 1200 DEF and requires 1 Tuner and 1+ non-Tuners. ATK and DEF leave more to be desired on a Level 6, we’ve seen better stats on most other Level 6s, generic summoning requirements are nice though, WIND is meh but Warriors again have had a resurgence. When this card is Synchro Summoned while you control no other monsters, you can Special Summon 1 Junk monster from your GY and this is a hard once per turn effect for Assault Warrior. Revival is nice, I guess it is when Assault Warrior is the only monster you have cause reviving one of the stronger Junk Synchro monsters can be strong, Berserker and Archer come to mind for revival, I’d say Destroyer but he won’t do anything much upon revival really. If this card attacks a Defense Position monster, inflict piercing damage. Ok, piercing is nice to have always, and 2100 is somewhat respectable when attacking into something in Defense Position since most monsters in Defense Mode don’t have much Defense, there are exceptions though (might or not be a hint for later this week :P). Assault Warrior is a good card for decks that can Synchro Summon the Junk Synchro monsters and is worth having 1 of in that case. Art: 3.5/5 Yeah, looks like someone who would do piercing. Stardust Assault Warrior, is another Monster to compliment the Junk theme, which makes me wonder why the Stardust is in its name at all…it doesn’t have anything effect wise or art wise to warrant that. Level 6, Wind, 2100 attack (meh) and 1200 defense (equally meh) with the generic Synchro requirements of one Tuner, and one or more non-Tuner Monsters. So if you Synchro Summon this card while you control no other Monsters (not cards, just Monsters) you get a +1 as you get to Special Summon a Junk Monster from your Graveyard. That’s good, it’s always nice to have an extra Monster, and you may have used a Junk Tuner to bring out this card, so it’s likely you have at least that card to bring back (and you can always continue to Special Summon something else after). Said effect is once per turn, which makes sense, and prevents massive swarming. This card also has Trample, which is nice, I feel outside of cards named Airknight Parshath, that Trample has been a relatively overlooked mechanic in the game. I guess Spear Dragon should have a mention here as well. 2100 attack isn’t great, but it’s enough that you should be able to do a little Damage, if you can get an attack or through with this card. Which I feel you should. Another nice addition for Junk users. Art: 5/5 Kinda feeling Gundam here, but non Junk or Stardust so much. Still nice.